Hamden Library Blog: CLA Special Achievement Award Winner! 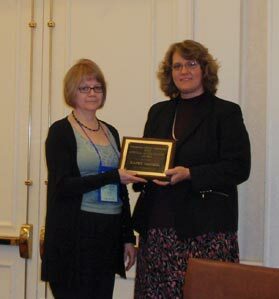 Congratulations to Hamden Public Library's own Nancy McNicol, winner of the 2012 Connecticut Library Association Special Achievement Award. Each year, CLA honors an individual who has implemented a significant project or initiated an innovative program which has had significant impact on the library, the community, or the library profession this year. In the spring of 2011, Hamden Public Library’s Associate Director, Nancy McNicol initiated plans to celebrate the life and works of Hamden native, former U.S. Poet Laureate and 2011 recipient of the National Medal of Arts, Donald Hall. She partnered with various Hamden agencies, the Mayor’s Office, the Connecticut Poetry Society and a number of town residents to bring the plans to fruition. On the evening of September 16th, more than 300 friends and poetry lovers paid tribute to Mr. Hall. He rewarded his audience with reminiscences of growing up in Hamden and readings of his poems. We are all thankful for Nancy's tireless effort creating this remarkable event, and grateful to the Connectict Library Association for recognizing her outstanding acheivement!